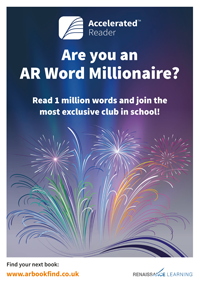 Accelerated Reader has now launched for all KS2 children. Accelerated Reader is a computer program that will help to develop your child’s independent reading. It works in quite a simple way; your child will pick a book at their own level, and when finished will take a short quiz on the computer. The quiz is a new feature of how we change books at school, but is a really important addition. If your child can pass a quiz about what they have read then this tells us that they have fully understood the content of their book. All children in KS2 have recently undertaken a short reading test that has assigned them a reading band (or Z.P.D.). Your child will now be able to select a book from our library that falls within their Z.P.D. This reading band will guide your child towards choosing books at an appropriate reading level that are challenging without being frustrating. The aim is for them to pass the quiz and be successful. All of our books in school have been newly labelled and put into colour bands that will further help guide your child in choosing a book. One of the best parts about using accelerated reader is that your child can choose their own books to read, rather than having one assigned to them. This will hopefully make reading a much more enjoyable experience as they can choose books that are interesting to them. As a part of our reading programme we ask the children to read at home to an adult at least three times per week, fill in their reading diary and have it signed by a parent. We would greatly appreciate your support in helping your child to do this, as ultimately the reading practise that your child gets outside of school contributes greatly towards them becoming a confident, successful reader. There are also many rewards and awards available for the children as they take the quizzes within school, which will motivate and interest all learners. We can't wait to find out who the first word millionaire will be! As a school, we are working hard to make sure that we are developing children's comprehension skills, this system will ensure that children have a much better understanding of texts before beginning a new book. If you have any questions or queries, please don't hesitate to come and see me.